Today ZED posted additional information at BS, through catalog scans that clarify all the questions raised yesterday, about his first images from 2010 LEGO Education new elements. But also adds info about more to come. 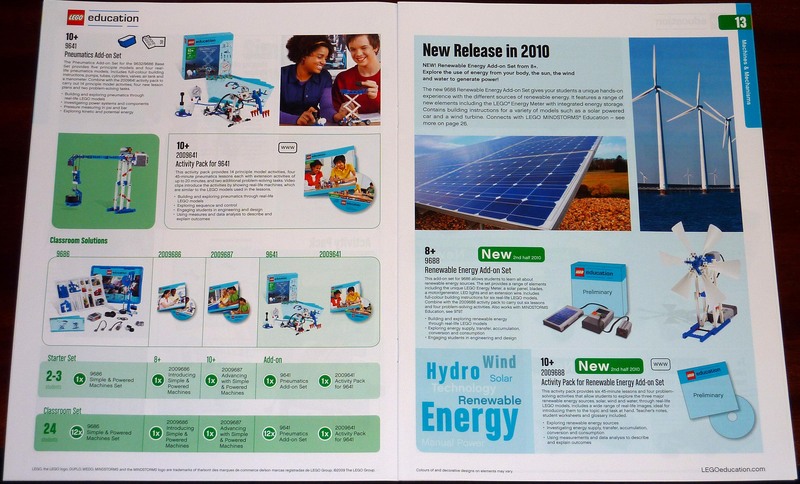 The overall information about the newly announced Renewable Energy Add-on Set (9688) and Activity Pack for Renewable Energy Add-on Set (2009688), is contained in the images bellow. Click to enlarge and read more about. 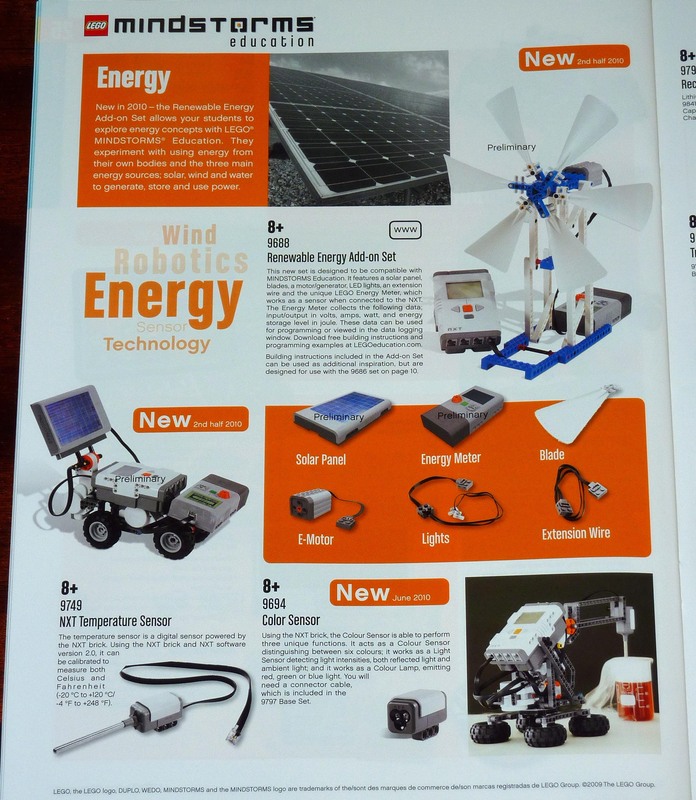 "The Solar Panel provides sufficient power to operate the LEGO Energy Meter and motors. It delivers: 5V, 4mA in direct light from a 60W incandescent bulb positioned 25cm from the solar panel (>2000 lux); and 5V, 20mA in direct light from a 60W incandescent bulb positioned 8cm from the panel (>10.000 lux)." Thinking in terms of Technic models, as for the former Solar Panels from LEGO Education eLAB (9912), this seems to be not much effective, for other usages than a laboratory experiment. They should hardly move a loaded motor and using multiple panels to increase voltage and current wouldn't be affordable for sure. Also they are quite ineffective for indoor usage as we can conclude from the figures announced. "This element displays input and output in volts, watts, amps, and energy storage level in joules. 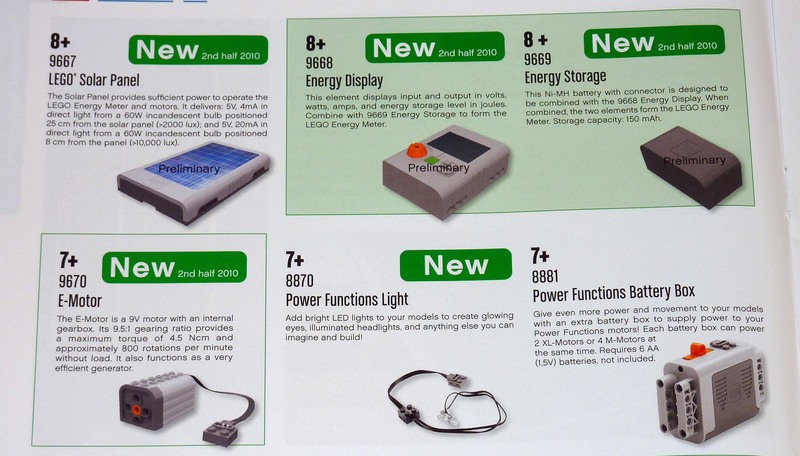 Combine with 9669 Energy Storage to from the LEGO Energy Meter. This Ni-MH battery with connector is designed to be combined with the 9668 Energy Display. When combined, the two elements form the LEGO Energy Meter. Storage capacity: 150mAh. Building and exploring renewable energy through real-life LEGO models. Exploring energy supply, transfer, accumulation, conversion and consumption"
From the description this energy storage unit, seems to be an huge evolution from the former Electric Capacitor (9916). Still don't see much possible applications for Technic models, which is not exactly the same as for MINDSTORMS. Here and from the images/examples in the catalog, it seems the Energy Meter could for instance be used to provide data to the NXT about the power readings and based on that it could also control the panel inclination, in order to maximize the panel solar efficiency. So I guess the PF connector on 9668, would be used to connect both the solar panel or the E-motor (generator). The Energy Storage announced capacity, is also not that much (150mAh), if compared to the other LEGO rechargeable batteries. So this should be targeted just for laboratory energy experiments/demonstrations and never to be seen as competing for the other's applications. "The E-motor is a 9V motor with an internal gearbox. Its 9,5:1 gearing ratio provides a maximum torque of 4,5 Ncm and approximately 800 rotations per minute without load. It also functions as a very efficient generator." The new E-motor is a low-torque/high-speed motor. Due to the high-speed and low internal gearing ratio, probably it has only one internal orbital gear stage, per opposition to the M and XL motors, which have two stages both. To better understand about the internal gearings from these motor, you may refer to the "Inside the PF M-motor" post published here a TBs a few months ago. With this characteristics, E-motor is suitable to work either as a motor or an electricity generator. In fact every motor does, but their normal characteristics (high-torque) make them unsuitable to work at a Wind Power Generator. Just because the wind wouldn't be sufficient to make the blades turning with such "generator" behind. It shouldn't be a coincidence that on page 14, we can see this new E-motor is not marketed as a Power Functions motor, like the M and XL versions on the same page, are! The prefix 'E' (Energy) is not suggesting any alignment with the other ones, which use size prefixes (M and XL). Also the 4x6x4 form factor, curved only at the topside, suggests a very specific use like in the Wind Power Generators. Because of these considerations, I guess this is not a motor aimed to be also used in future Technic sets, hence not branded with the Power Functions tag as none of the other element above. 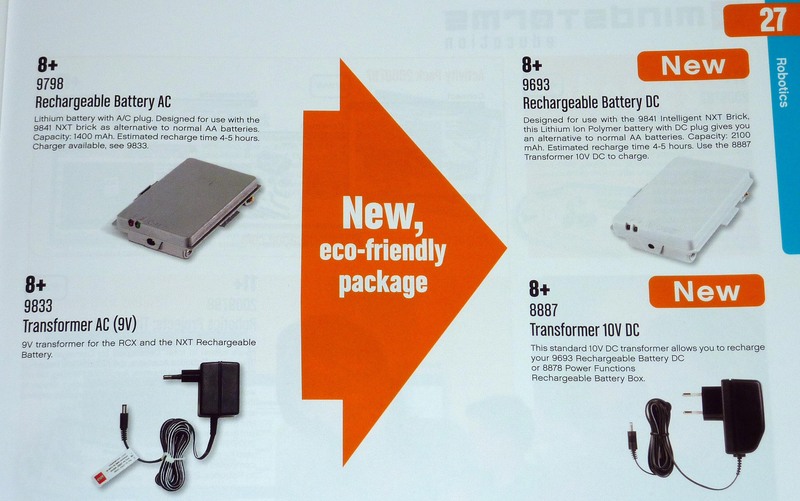 So the NXT rechargeable battery specifications, change from 1400mAh (9798) to a 2100mAh Li-Ion Polymer battery (9693). Following the trend on the Power Functions line and actual safety requirements, this is going to be a DC charged battery and then use the new 10V DC transformer (8887), instead of the former 9V AC version (9833). *) M and XL motor characteristic data, taken from Philo's measurements on his "Lego® 9V Technic Motors compared characteristics" webpage. Apart from the price of this new battery pack I'm also curious about the weight. The L-ion battery pack for trains is incredibly light and a light battery pack for robots means it's easier to make for example walkers plus wheeled robots would need less energy to drive because of the reduced weight making the battery last even longer. 700mAh polymer cell * 2 (9798) and * 3 (9693) to use a different adapter still does not understand why. Clearly, a 2100mAh battery which is very attractive. In addition, it is a beautiful white color, too. I still have high hopes for PF-E motors. It is 800rpm. PF-E motor-driven linear actuator more faster then PF-M or PF-XL use. As far as I know, recent toy safety regulations, made TLG to decide on DC Power transformers, rather the former AC versions. That's why the PF Rechargeable battery was made to work with a DC power transformer already. Progressively the old AC transformer will be phased out, and time for that in the NXT has arrived! Also years ago, when this type of transformers were introduced, production of an AC transformer was much cheaper than a DC one. Nowadays this doesn't seem to be true anymore and so there is no justification to keep producing the AC ones. yes the LiPo batt pack should be lots lighter its just a shame they could not fit it inside the battery compartment, so that you could build the standard sets. as for the colour I think it'll be off white to match the NXT Brick not true white. I see the colour sensor is available seperatly too 9694 and theres a new resource kit 9695... perhaps this will answer the upgrade kit questions!! I actually like having high output speed for my motors for the same reason I like technic, because you build these mechanicle mechanisms that work and can see them working. Where's the fun in having any of it done for you like the gear reduction in the pf motors? I want to build that reduction myself and see it working. This new E-motor is a nice attempt at that but I would really like a REALLY high power, fast motor like the buggy motor or maybe something even more powerful but in a PF format. In most cases, simply there is no space for that, inside the MOC with the scale you want. There must be a compromise here. I didn't know instead of AC to DC What has changed because of safety regulations. Certainly compared to DC SMPS AC transformer that is affordable and effective. I can see it has a lot of cell phone chargers. LEGO Group has changed too late, just sad conservative. I don't think I would replace the existing PF M and XL motor, they are great and you would always have those. I would just add an L motor that has similar or better performance than the buggy motor. This way you don't need to compromise. You have motors with lots of gearing down when you have little room, and one motor for sheer awesomeness! The main problem with the buggy motor is that it is very power hungry and neither the PF IR-Receiver nor the PF battery box allow for enough current to be able to use it together with anything else. That measn that if you use a buggy motor for moving your vehicle and any other motor for steering, as soon as you use both together for more than about a second the whole system will shut down because the overload protection kicks in. You will not be able to use your vehicle for several seconds after that until the system starts giving power again. It is true that for most applications, the PF medium/XL motors are fast enough, and there is no need to gear up to turn the output at a suitable speed. However, it is not always possible to turn the output at the same speed (or lower) as the motor, without gears slipping and axles bending under such high torque. In a complex chain of gears and axles transmitting the motor's rotation from one place to another, it is often necessary to spin the largest and most vulnerable 'sections' of gears/axles at a higher speed (applying less torque), to prevent long axles from bending and bevel gears from slipping under the torque. If the torque applied to axle is too high for the rotation speed, the axle will bend, temporarily delaying the transmission and creating a 'backlash' effect as seen on the 8295 telescopic handler steering. PF medium motors rarely cause severe backlash when connected directly to a long axle, and they use a very good balance of torque/rotation speed, and so I would agree that the E-motor has little advantage over the M-motor in any situation other than when efficiency matters. However, both the XL and NXT motors apply an enormous torque with quite low rotation speed, and can easily cause severe backlash when connected to a long axle, due to their extremely high torque. I think two new Lego motors are needed: an S-motor with torque of around 10N.cm, but very low rotation speed, and another XL-motor, this time with a torque of 10N.cm, but a rotation speed of around 1000rpm. Small motors normally fit into small spaces, and so are rarely attached to long axles, and so would not need a high rotation speed. It would be interesting to know the no-load current of the E-motor, as it could possibly draw power from the NXT motor port A, if the no-load current consumption was low enough. "I think two new Lego motors are needed: an S-motor with torque of around 10N.cm, but very low rotation speed, and another XL-motor, this time with a torque of 10N.cm, but a rotation speed of around 1000rpm". Those motors sound great! The large motor you mention is just what i'm after and the small motor would be great if it's speed was very low like 20 rpm (one rev every 3 seconds) and if it was reliable. My past expierience with lego micro motors have not been so good haha but i'm sure a new one would be much better. I just got a second NXT (yeah, welcome late to the party, Rafe) and was playing with the bluetooth communication between the bricks. The second NXT uses the new 9693 battery but my original one used the old 9798. I had it plugged in and was running it and charging it when I noticed that the NXT wasn't sitting flat on the table; the bottom of the battery housing was not flat but puffed out! I extracted the battery pack from the NXT and noted that it was puffed out on both sides and thus had been wedged tight in the NXT. I unplugged it and felt it; it was not hot. But as I inspected it, it quite literally farted; a foul-smelling gas passed out of the housing, making a hissing sound. It smelled like a bad chemistry lab. Of course, I called customer service and they are working to make it right. Has anyone else experienced a battery back doing this?